Officially known under the name of the Commonwealth of Pennsylvania, Pennsylvania is a state in the Mid-Atlantic region of America. It is home to the Appalachian Mountain Range and has borders with several other states, namely Ohio, New York, New Jersey, West Virginia, Delaware, and Maryland. The Canadian province of Ontario also has a border with Pennsylvania, and pat of the state is situated on the shores of Lake Erie, one of the five Great Lakes of North America. Nicknamed the 'Keystone State', Pennsylvania is the 33rd biggest state in terms of area but has the sixth highest population, making it one of the top ten most densely populated states of America. Pennsylvania covers an area of 46,055 square miles and has an estimated population of 12.8 million. The capital city of Pennsylvania is Harrisburg, but the biggest and best-known city in the state is Philadelphia. Here are some important facts and overviews of the largest cities in Pennsylvania. Philadelphia is by far the largest city in Pennsylvania and is also the sixth most populous city in the entire United States. 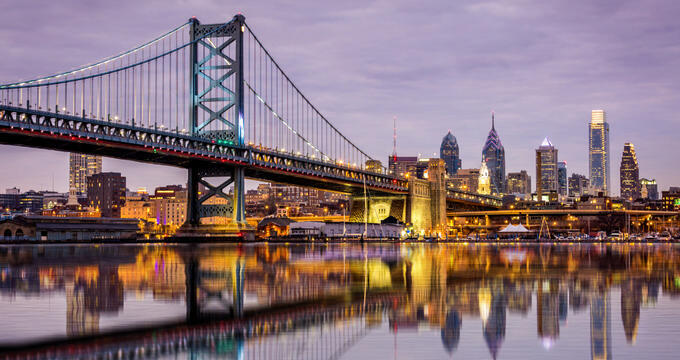 A globally famous city with dozens of historic landmarks and attractions, Philadelphia is located on the Delaware and Schuylkill Rivers in the Delaware Valley and covers an area of 142.71 square miles. Philadelphia has an estimated population of 1.58 million people, with over 6 million living in the surrounding metropolitan area. The city was founded in 1682 by an English explorer and writer named William Penn. Philadelphia has a rich history behind it, playing a key role in various major events of American history like the American Revolution. The Declaration of Independence was signed in the city, and the first library, zoo, business school, and hospital in the United States were all constructed in Philadelphia. Pittsburgh is the second biggest city in the state of Pennsylvania. Located in Allegheny County in the southwestern part of the state, Pittsburgh covers an area of 58.35 square miles and has an estimated population of around 302,000 people, with over 2.3 million living in its surrounding metropolitan area. The city is known as 'Steel City' for its enormous steel industry and 'City of Bridges' due to the fact that over 400 different bridges can be found within the Pittsburgh city limits. Pittsburgh is a major industrial center for Pennsylvania, with several global companies like Google and Apple having locations in the city. Pittsburgh is also ranked as having some of the best quality of life factors in all of the United States and has consistently been classed as one of the most liveable cities in the nation. Allentown is the third largest city in the Commonwealth of Pennsylvania. This city is located in Lehigh County in the eastern part of the state. Allentown covers an area of 18.03 square miles and has an estimated population of around 121,000 people, with over 825,000 living in the surrounding metropolitan area. Allentown, nicknamed 'The A' and 'A-Town' was founded in 1762 by William Allen, and is currently classed as one of the fastest growing cities in the state. It was founded on the Lehigh River and has close ties with Lehigh Valley cities like Bethlehem and Easton. Situated in Erie County on the northwestern edge of Pennsylvania, Erie is the state's fourth biggest city overall. It was founded in 1795 and named due to its location on the shores of Lake Erie, which was named after the Native American people that lived in the area for many years before European settlers arrived on American soil. Erie covers an area of 19.37 square miles and has an estimated population of 98,000 people, but attracts millions more each year due to its status as one of the key touristic destinations in the state of Pennsylvania. Major attractions in and around Erie include Waldameer Park, Lake Erie, and the Presque Isle State Park. Reading is the fifth largest city in the state of Pennsylvania. It is located in Berks County in the southeastern section of the state and is almost equidistant between the biggest city in Pennsylvania, Philadelphia, and the state capital of Harrisburg, so has always been seen as a key transportation hub for the state. Reading was founded in 1748 and named after an English city of the same name. Reading covers an area of 10.13 square miles and has an estimated population of 87,000 people, with over 410,000 living in the surrounding metropolitan area. Reading is known as a great recreational city with a lot of cycling and hiking trails.